Take a look at the latest offering from this beautiful brand – a whole host of nursery wares in bamboo muslin. We adore Aden and Anais and the love affair continues with the new line of bamboo muslin baby products, which have just landed on the Australian market. 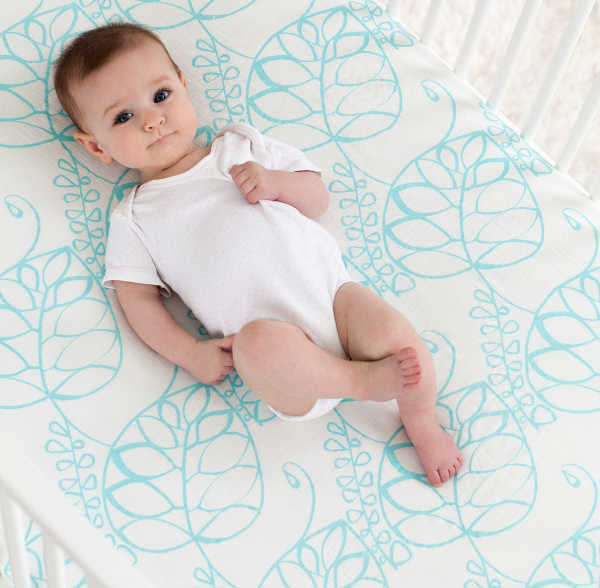 The range includes a selection of bamboo muslin blankets, fitted cot sheets, changing pad covers and bibs. The changing pad covers ($34.95) are a welcome change up on the traditional gaudy covers. They’re made of silky rayon from bamboo fibre muslin and are durable enough to use every day. The bamboo Dream Blankets come in colourful, modern designs and are super soft. They can be used in so many ways, and come in a generous 1.2 x 1.2 metres, for $74.95. The fitted cot sheets are the perfect place for a baby to lay their head. They’re $44.95, and are made from the same beautiful, soft bamboo as the rest of the range. Finally, the Burpy Bibs are almost too good to be used as bibs! They’re a generous size, for maximum coverage, and cost $19.95. Shop the range at The Baby Closet.